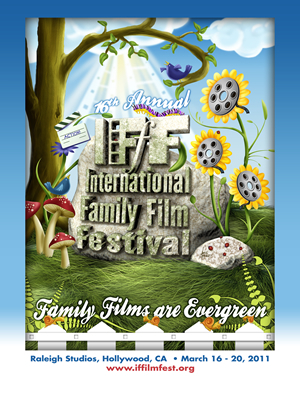 Nigeria and other countries are going to participate in the 16th edition of the International Family Film Festival taking place at the Raleigh Studios in Hollywood from March 16-20, 2011. The details are in the following press release from the organizers. HOLLYWOOD, Calif., Feb. 28, 2011 /PRNewswire/ — It’s the film festival with a global reach and a family heart. The 16th International Family Film Festival – unspooling over 85 family-friendly films from around the world – is set for March 16-20 at Raleigh Studios in Hollywood. This year’s festival includes 33 feature-length films, opening with Cafe, a Philadelphia-based drama with Jennifer Love Hewitt, Amish Grace, a biographical drama with Kimberly Williams (We Are Marshall), plus high-profile shorts such as Chapman University’s Without Wings, starring Hailee Steinfeld (True Grit). A large Chinese film delegation will be on hand to support local entries, and Chinese actress Ruoming Huar of the Mongolian-language film Horizon, is scheduled for 6 p.m. March 19. Other filmmakers are traveling to the festival to support film projects from as far as Australia, Syria, Nigeria and Alaska. A half-dozen student filmmakers from Sydney will be on hand to cheer on Almost 100, a short about life-threatening teenage challenges. Another entry, a feature-length survival drama entitled 48 Below! – employed many residents of Sterling, Alaska, to assist in its production, and a local contingent will travel to the fest. Last year’s IFFF drew 5,000-plus film fans and industry professionals. The festival market generally produces several film-distribution deals, and many screenplays from its screenwriting readings have secured option deals following the Screenwriter’s Showcase being held this year on Sunday, March 20th. A film produced from a 2010 IFFF screenplay winner, First Dog, has been accepted into the film competition this year. The festival wraps Sunday, March 20th with a full awards ceremony that is both uplifting and entertaining. Annually IFFF recognizes outstanding achievement in multiple feature and short-film categories, acting and screenwriting. The fest also screens the finalists of the “Movies With A Message” contest (www.messagemovies.org) sponsored by Happy House – Good Choices, a non-profit that encourages youth to make inspirational movies with their families. For schedule and tickets visit www.iffilmfest.org or call 818-230-2572 or 661-257-3131.